Established more than 50 years ago, Cargill Enterprises employs more than 80 people with disabilities. From postal sorting to joinery, sign-writing to electronic waste recycling, it offers a wide range of goods and services. There's also an important byproduct. It's called self-esteem, writes Shane Gilchrist. 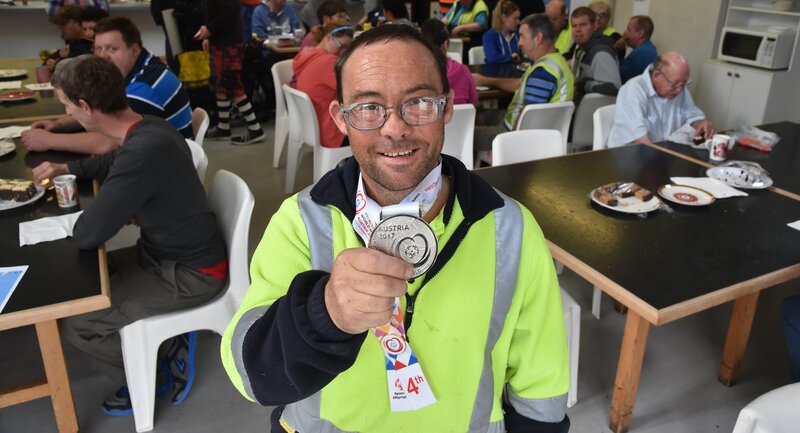 They are talking in the dining room of the South Dunedin social enterprise, sharing the news of Nathan Symister's silver medal at the Special Olympics World Winter Games in Austria. Fast-forward a week. Same place, same people. The smell of warm savouries fills the dining room as workers file in to enjoy a few extra goodies, cake included, over morning smoko. Small posters adorn walls and tables. "Nathan Da Man!'' says one. "Nathan Symister, our Olympic champion,'' another proclaims. The subject of all that excitement sidles in, that large silver medal gleaming as bright and proud as his smile. A huge cheer erupts before Kemp makes a short speech congratulating Symister. Then the questions flow: "What was the food like in Austria?'' "Did you see the Von Trapp house?''. Eventually, the hubbub subsides. Symister remains behind. As he polishes off what remains in his mug and politely declines the chance to eat leftover cake, he talks of other opportunities that may seem far removed from Olympic glory, yet remain important nonetheless. It's Symister's first day back at work. 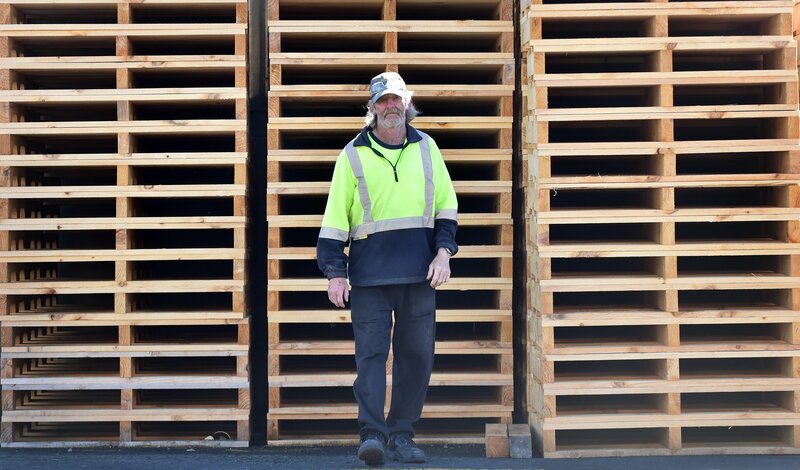 Due to return the previous day (his employers gave him an extra day off to recover from the 32-hour travel schedule), the 42-year-old works in the timber processing and joinery division at Cargill Enterprises. He's been here for 24 years, has seen the demand for work grow, matched by an increase in fellow workers. The trading arm of the Disabled Citizens Society (Otago) Inc., Cargill Enterprises was established more than 50 years ago, and now employs more than 80 people with disabilities. 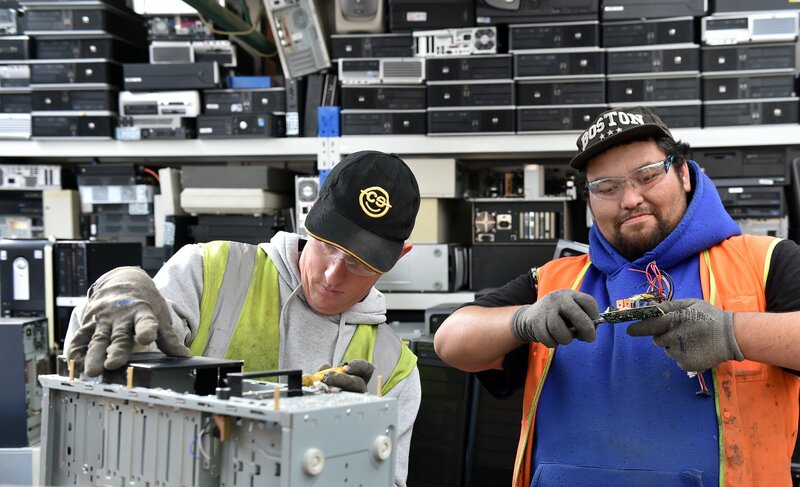 Its services are varied: postal sorting and packing; joinery, timber processing and manufacturing; food packing; sign-writing and branding; a catering service; and an electronic waste division that breaks down and recycles the computers of yesterday and yesteryear. Recently registered as a Tertiary Education Organisation, the business has 21 staff attending regular classroom-type training programmes during paid work hours and tutored by contracted educators. "We primarily work in the area of intellectual disability and, to an extent, physical disability,'' Kemp explains. "We have 84 staff members. We added 12 staff last year and are on track to do the same this year. We have an employment waiting list of 20 to 30 people. "Sometimes people are referred to us; others come of their own accord. We also gauge how many hours different people are capable of working. 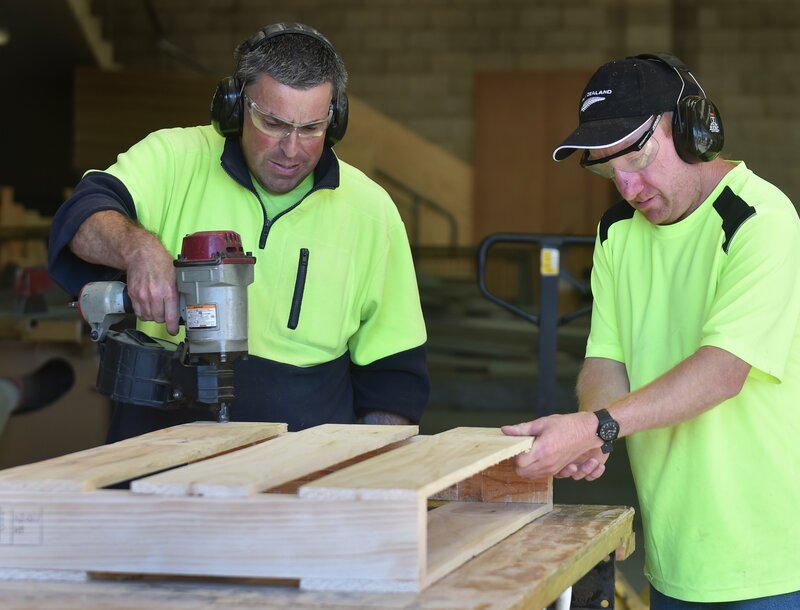 For example, most of the guys in the joinery area work 40 hours a week, but not everybody can manage that. "We have employment agreements with our staff. There are expectations, codes of conduct, health and safety rules, things typical to any workplace. We stipulate punctuality, because we don't do anyone any favours by just letting them do what they want,'' Kemp says. "There is training and development. Pretty much none of my staff has a recognised qualification, so we are trying to get some into a position where they can try to do some unit standards. "There are employers out there who are to be commended,'' Kemp says. "Take Z. Throughout the country, they employ staff who have disabilities. I think they are leading the way. Kevin Small, the man so upbeat about the success of Symister, plants himself at the smoko room table recently vacated by his skiing, medal-winning colleague. Like Symister, he enjoys his job. The 49-year-old has worked at Cargill Enterprises for 33 years. He wakes between 6am and 6.30am each work day and catches two buses from his home in Helensburgh, where he lives with his father and stepmother. "The work I do is good. 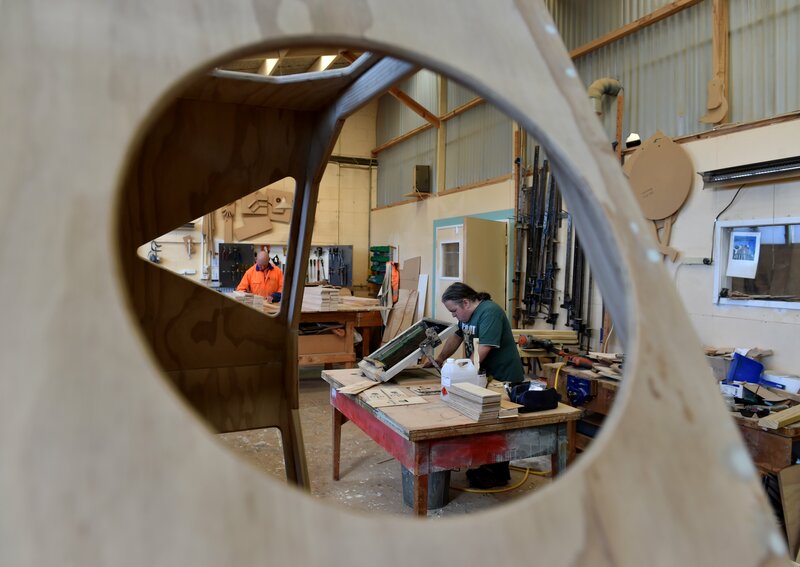 I'll get given instructions on a certain job to do and I just head off and do it,'' Small says of his role within Cargill Enterprises' timber workshop, which involves a range of joinery projects, from building picnic tables and freight pallets to constructing small wooden wine boxes. Small is also the firm's main forklift operator. It's a job that requires both skill and attention to surroundings. Clearly, someone who enjoys a joke, Small likes to rub shoulders with his colleagues after hours, too. There's the weekly tenpin bowling competition, the social outings with fellow workers, the occasional camp. "On Fridays, I'll go to a mate's for tea, then do tenpin, then go to Moana Pool, where I do a few laps. At the weekend, I'll go and watch club rugby in the winter. I used to play basketball but have had two hip replacements, so I've given up. Small has raised a crucial point: Cargill Enterprises has helped him develop a work ethic, to which is nailed a sense of pride and contribution and - importantly for a sector of society often marginalised - a strong social connection. Agreement can be found around another corner, where Ron Ching (25) is one of several workers disassembling various computers, the innards of which (in particular, aluminium heatsinks and copper components) are sold on the international commodities market. The ongoing stress caused by the Canterbury earthquakes several years ago prompted Ching to move from Christchurch to, firstly, Invercargill then Dunedin, where he now lives with his brother. It's been a good decision, he says. There's a bright yellow van parked out the back of Cargill Enterprises. The sides of it are emblazoned, larger than life, with the face of the skiing, smiling Symister. The vehicle might be spotted, on weekends and/or weeknights, ferrying workers to social events and sporting contests with other organisations. On other occasions, however, it is used to satisfy the various connections that extend, like tentacles, outwards from the South Dunedin premises to other businesses around Dunedin and Otago. A service provider to the Ministry of Social Development (from which it receives some funding), Cargill Enterprises straddles a delicate line: it is a non-profit entity, yet it needs to operate as a business in order to not only survive, but grow. "All things considered, independence is the path we'd like to take,'' Kemp says. "We want to be in charge of our own destiny. Funding can be fickle. Long-term business planning is difficult when you don't know if funding will continue. "When someone comes in to talk to the sales team or myself, it's a business-to-business interaction,'' Kemp emphasises. "The overarching approach to securing contracts is based on three principles: the work must be light (no heavy lifting), repetitious and clean. "There is a section of society that thinks we are exploiting our workers. But nobody is getting fat off the workers here,'' Kemp says, referring to the fact a number of his staff are on minimum wage exemptions. Under the Minimum Wage Act (1983), employees over 16 must be paid at least the relevant minimum wage (currently, $15.75). However, labour inspectors may issue minimum wage exemption (MWE) permits to employees who have a disability that limits them carrying out the requirements of their work. "If a person's skills, ability and output are such that they take a person into a category that is below the minimum wage - and the policy of the land is that we have a minimum wage - then somebody has to top that up,'' Kemp says. Kemp points out Cargill Enterprises and five other social enterprises in New Zealand have petitioned bureaucrats and policy-makers to improve support for people with mental, intellectual, physical and sensory impairments. This ongoing campaign includes proposals that would mean all workers receive a take-home pay equitable with their non-disabled working colleagues. "More than 800 disabled individuals in New Zealand have a minimum wage exemption permit, which means their employer can pay them less than the minimum wage,'' a spokesperson for the Ministry of Business, Innovation and Employment explains. Officials have been working with the sector so that the Government can consider advice on possible alternatives later in the year. Dean Joseph checks a pair of headphones. Judy Howard says money is only a small part of the overall equation. Her 24-year-old daughter Tegan might have only been at Cargill's "a little while'' and works just one day a week there, yet it has changed her life. "For her there is this sense of belonging, a sense of pride. She loves going there; she loves working, knowing she is doing something responsible. That whole work ethic aspect is important. "She knows the boundaries, that she has to be on time, to be responsible. People aren't just there to muck around. They are there to do a job. And that's what the real world is like. If you turn up late you get told off, just as you would in any workplace. "I would hate to think what would happen to some of those people if Cargill's wasn't there. Some people have been there for years. Some might not start work each day until 9am but they will be there at 8am. There are other flow-on effects. An outspoken person who has advocated for the rights of her daughter throughout her life, Howard has some reward for her parental efforts. "All those years of fighting for help, putting in that hard work ... I've seen a result. There is that sense of achievement for me, I suppose. I'm proud. Although it should be emphasised Cargill Enterprises is not a respite care facility, it does offer its staff a plethora of social opportunities, meaning the parents of some employees might enjoy some time out, too. "When an opportunity like Cargill comes along ... that's a day a week I don't have to worry about her,'' Howard says. "It's nice to know she is doing well. She comes home and talks about her day. She has become more interactive with people. I see that in others who work there, too. I can't sing their praises enough. "Mainstream society could learn a lot about acceptance of others. There is a huge range of personalities there, different needs, yet we could go away on a social outing, a camp, and there will be no problems. "I don't know if a lot of people in the community even know what Cargill's does. It's about giving people a chance.